Greek landscape or region on the southeastern peninsula Greece with just under 3,800 km², in which the state capital of Athens is located. 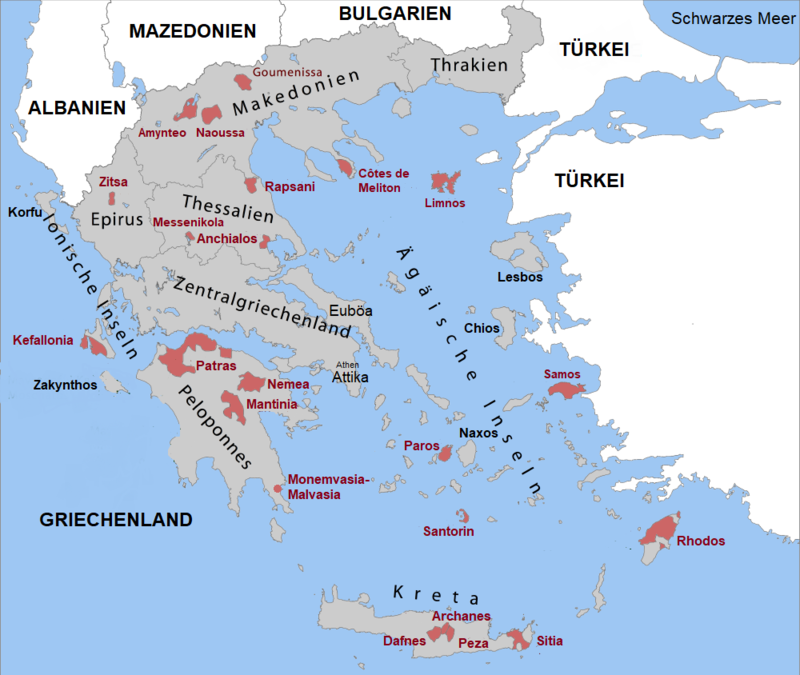 Attica, together with the island of Euboea (modern Greek Ewwia) immediately to the east and the region of Boeotia (Viotia or Votia) to the north, are middle or even more frequent Central Greece designated. The area was inhabited around 2,000 BC by the Ionians from the North Balkan, the most progressive tribe of the Greeks. Due to its proximity to the Orient, it was known for its great wealth and high cultural flowering in poetry (Archilochus and Homer ), Architecture and fine art (ionic style). In the 9th century BC they were then named by the Dorians Ionian Islands ( Kefallonia. Corfu. Zakynthos ) and on the coast of Asia Minor in today Turkey on the mainland, they remained only on Attica and Euboea exist. The vast area now produces one-third of Greek wine, but unlike the rest of the Greek wine-growing regions, there are very few grape varieties due to the warm and dry climate. About 90% knows the white Savatiano the vineyards, the standard variety for the resin wine produced here in truly huge quantities Retsina, Almost all of the rest is with the variety Roditis occupied, which serves primarily as Verschnittpartner. International varieties are on the rise. There are none as POP classified appellations, but there are many PGE wines (Land wines = Topikos Oinos) produced in red, white and rosé. Well-known producers are Cambas, Château Matsa, Evharis. Hatzimichalis, Kokotos, Kourtakis and Strofilia. This page was last modified at 14 February 2018 at 14:43.